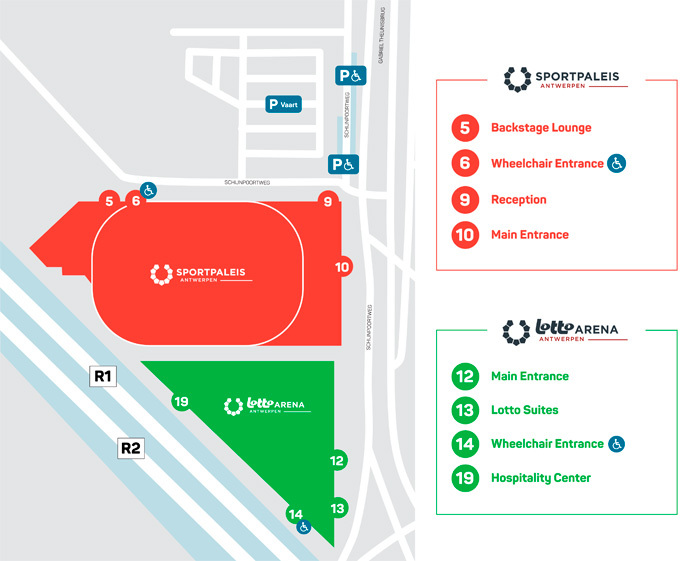 View the plan to see where the parking spaces for visitors with a disability card and the entrance for wheelchair users (entrance number 14 of Lotto Arena) are located. Lotto Arena has special spaces for wheelchair users and their companions. If you are a wheelchair user please call us on 03/400.00.34 (from abroad +32.3.400.00.34) to book a wheelchair space. Make sure to clearly mention that you are a wheelchair user. Or contact us by mail via service@teleticketservice.com. We will be happy to assist you to the wheelchair spaces in the venue. All visitors – except those who booked dedicated wheelchair spaces – enter Lotto Arena via the main entrance. In the entrance hall you will find color signage to the seats. Please check the color mentioned on your ticket. Please note! The seating plan only indicates the color zone of each seat. This seating plan does not make any distinction between price differences of a particular event. 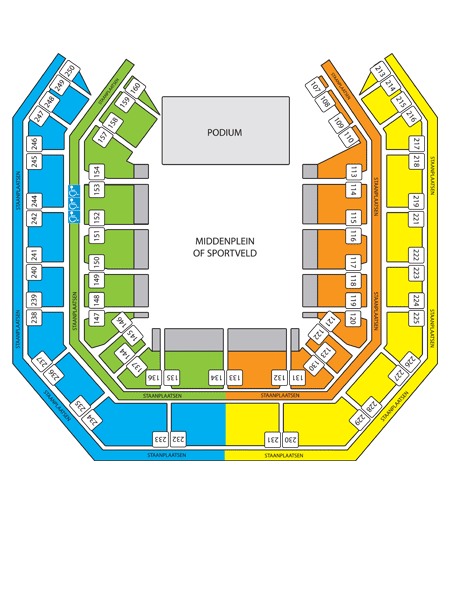 Also please note that different seating lay outs are possible in the Lotto Arena. Each organizer of an event is responsible for the pricing of each seat.